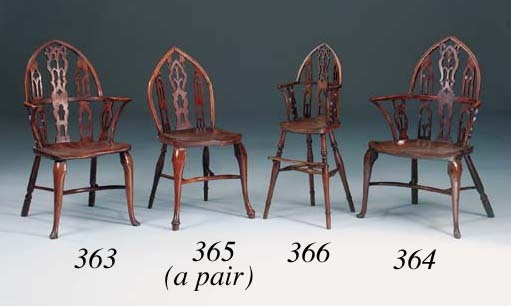 To date, Gothic side chairs from the 18th century are unrecorded. This particular pair of chairs is intriguing, however, in that a number of constructional details would suggest a later date, perhaps the early part of the 19th century. These include: no key joining the arch at the point, the splats are pegged in from the reverse as opposed to the front, the rear legs are attached using the blind socket method. The crack in the left-hand side arch on one of the chairs is also suspicious.